Comedian, actor, quiz show host, singer, adventurer, presenter. 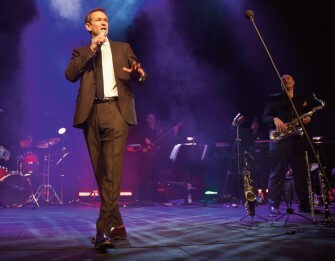 Alexander Armstrong has many strings to his entertainment bow. Music is a huge love of Alexander’s and he presents a weekend radio show for Classic FM. In 2015 he joined forces with the stars of the Warner Music Group, working on a medley of classical songs for his debut solo vocal album, A Year of Songs. It reached number six on the UK Albums Chart in its first week and topped the UK Classical Charts, the first time a comedian/actor has reached number one in that charts! In 2016 he released his second album, Upon a Different Shore, and toured the UK performing. He also starred as Max Detweiler in the TV special The Sound of Music Live for ITV in 2015. Expect an eclectic programme from ‘A Nightingale Sang In Berkeley Square’ to ‘You Make Me Feel So Young’ and ‘Girls Just Want To Have Fun’. Sponsored by THE EASTBURY HOTEL.